In the last 30 days, I have seen my blog traffic jump by 81.3%. I have seen steady growth since I converted from TypePad to self-hosted WordPress two years ago (up 338.6%). 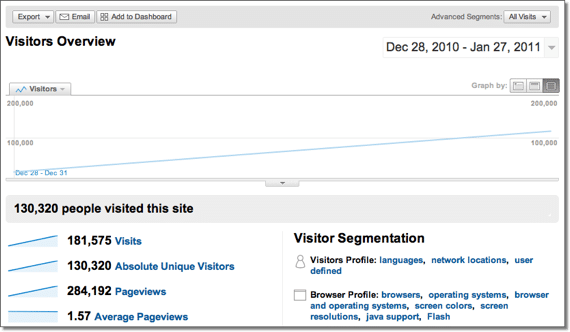 But the last 30 days represented the largest single jump in my traffic ever. I want to share why I believe this has happened, so that you can apply what I have learned to your own blog. Hopefully, you will experience similar results. First of all, this traffic increase wasn’t the result of a single post that just happened to catch fire. Nor was it the result of a large site linking to me. Rather, it was the result of several specific changes I made to my blog. Even here, I don’t think it was a single change, but rather all of them working together that accounted for the impact on traffic. The good news is that these are all things you can replicate. Absolute unique visitors went from 71,885 last month to 130,320 this month (a 81.3% increase). Pageviews went from 173,794 to 284,192 (a 63.5% increase). Now, what did I do to make this happen? I had already installed Standard Theme back in October. This had an immediate, positive impact on my traffic. This was due primarily to faster page load times and better Search Engine Optimization (SEO). Other bloggers I know have had similar results from this premium theme. Increase my blogging frequency. I have always known that there is a correlation between frequency and growth in traffic, but I proved it to myself empirically this past month. For most of last year, I posted three times a week. I decided I would post five times a week this year, Monday through Friday. Write shorter posts, shorter paragraphs, and shorter sentences. I owe this insight to CopyBlogger’s post, “Shorter Is Better.” I determined that I would keep my posts between 500-600 words. I would include no more than 3-4 sentences per paragraph. I would avoid compound sentences wherever possible. Improve my SEO metadata. I started using ScribeSEO. This WordPress plugin analyses your posts and gives you a score, based on how Google will rank it. Best of all, it tells you how to tweak your metadata to improve your score. It’s expensive, but I think worth every penny. Become more engaged in comments. I changed my commenting system from native WordPress to Disqus. This is the system that most of the larger sites I visit use. I believe it is the easiest, most elegant commenting plugin available. It also allows me to reply to comments via email, which makes it super-easy for me to engage with my readers. Encouraged by these results, I plan to continue with my strategy. However, I now have a list of three new actions I plan to take next month. I’ll report on those in another post. Question: What specific actions can you take this next month to increase your blog traffic? You can leave a comment by clicking here.